Discussion in 'Team A' started by HoneyRoastedPeanuts, Dec 10, 2011. 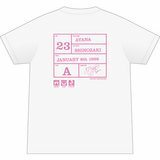 As predicted, the AiKaBu senbatsu is for this single. And along with it, ayanan is also on one of the P48 song as well. So her P48 participation was good for something after all. Being a fan of certain members can be really frustrating. Edit: I forgot she also was in the AiKaBu senbatsu, so at least she is featured in one MV. I watched her, Mako's and Chiyori's video and somehow they all do something different at 0:38 (time based on Ayana's video). I wonder if she has a chance to win. Edit: Nevermind, just saw that Yokoyama "Dance Machine" Yui also participates. 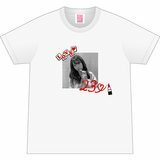 I mean it's better than Megu's birthday t-shirt, but that's about it. Photos on T-shirts always look bad. It's still young and 23 is a nice number. Ah sorry, is it specifically the age of 23 or does she just somehow start to feel old now?